It’s ten past five o’clock in the evening of July 17th, 2011. The bar is completely silent except for one voice… My own. In New York City—the one place in the U.S. with a sizable contingency of faithful soccer followers—and I’m the only one cheering for Japan over the red, white and blue in the Women’s World Cup Final. 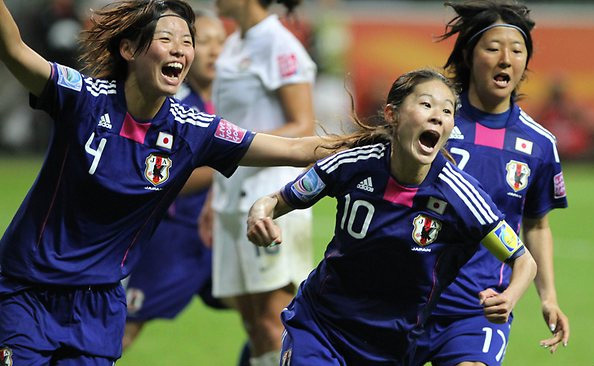 The “short little ladies,” as the Japanese coach called them, of the Nadeshiko Japan has just pulled off one of the greatest upsets in the history of sports. Going into the game, the sentimental value on Japan’s part was well publicized and documented due to the tragedy of the March 11th earthquake and tsunami and the subsequent nuclear disaster in northern Japan. Many of those affected by the calamity are still living in shelters, and in a nation like Japan with its homogeneous society, the tragedy has truly united the country. Men and women. Young and old. Soccer fans and baseball fans. For this reason, and not because they were such heavy underdogs, Japan was easily the sentimental favorite for anyone outside of the U.S. There was no doubt that the U.S. played better overall and should have won the game. The first thirty minutes put supporters of the Japanese in constant fits of agony. Every five minutes, it seemed like the U.S. was on a break, threatening the Japanese goalie, only to see the ball somehow go wide or hit the post. The more the U.S. threatened, the more Japan escaped without conceding a goal, the more I began to wonder if I was about to witness one of those magical sports moments. Even when the U.S. went ahead 1-0, then 2-1, I had a feeling Japan was somehow going to come back. It was one of those inexplicable moments where the weight of a catastrophic tragedy propels the game to a whole new level of drama, inspiration and magic. In such moments of pure emotion and adrenaline, better talent and performance doesn’t always equate to victory. And when element of perseverance in the face of tragedy is associated with the underdog team, the story often seems to end in a fairytale fashion: A perfect upset. Japan, while clearly being dominated for much of the game, scored their first goal off a lucky bounce that resulted from a clearing miss by the usually reliable Ali Krieger. Their second goal came off a corner kick where Homare Sawa somehow, almost magically flicked the ball off the right side of her foot from a spot where math would deny her an appropriate angle. Two unbelievably fortuitous goals that were in stark contrast to the beautifully crafted goals by Alex Morgan and Abby Wombach. How did this happen? While religion lies low on my mind, do I dare call it divine intervention? There’s just no other way to explain how Japan won a game where they didn’t have possession, typically their area of strength, were outclassed at almost every position and went up against Hope Solo in penalty kicks with a very shaky goalkeeper on their side. Studio heads take note: Hollywood couldn’t have scripted this any better. Whether it was sheer luck or divine intervention, it was yet another reminder of the power of sports and its healing power. It didn’t matter that I wasn’t directly affected by the tragedy in Japan. But knowing that my own father, who never sacrifices sleep in order to catch a game on television, woke up at 3:30am Japan time on a Monday to watch this game, I know how much this game meant to him, how much this game inspired him and how much he wanted to be inspired by this game. There is no doubt there were more cheers and tears at dawn across the country on Monday than any other moment in its sports history. Consider what the Saints winning the Super Bowl meant for New Orleans, even five years after Katrina. Now, make that an entire nation and only four months after a tragedy of much bigger magnitude. The degree to which this victory has both inspired and healed the country cannot be stated in mere words. Finally, I leave you with the meaning of Nadeshiko, the nickname of the Japanese women’s team: While the literal translation is “pink dianthus flower,” which is known to be very tough and resilient, the term-in-use actually comes from the phrase Yamato Nadeshiko, which signifies “ideal Japanese women with grace and beauty.” Japan not only won the World Cup, but also received the FIFA Fair Play Award, a recognition fitting for Nadeshiko, especially for their graceful, technical style of play. Even an average Japanese soccer fan can’t even name more than a few players on this team, much less know that there’s a women’s league in Japan. But these previously unknown “short little ladies” of Japan are now standing taller than ever, and for many days, months and years to come, will forever be revered as heroes in the Land of the Rising Sun. With the abundance of Japanese baseball players in the Majors these days, it’s not difficult for any average baseball fan to name one of them. Ichiro? Sure, who hasn’t heard the perennial All-Star’s name? Hideki Matsui? Come on, he’s Godzilla. How about Daisuke Matsuzaka? The Red Sox Nation will laugh at you for not knowing that one. The list goes on and on with the likes of Hideki Irabu, whom George Steinbrenner once called a “fat toad,” while Mets fans might recall Tsuyoshi Shinjo and Kaz Matsui, both of whom made their presence known more with their dyed hair and bright-colored wristbands than their play on the field. 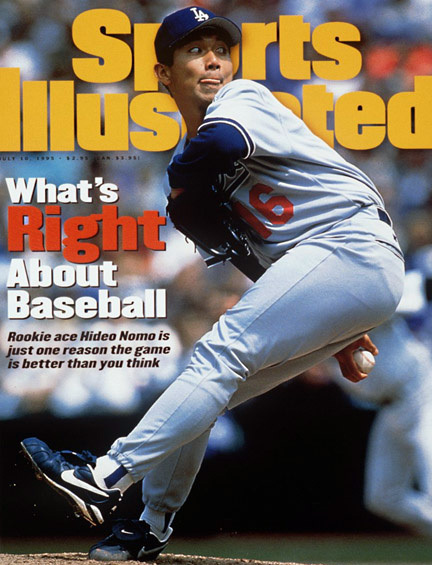 But if you asked me the same question, I only have one answer: Hideo Nomo. The one who started it all. 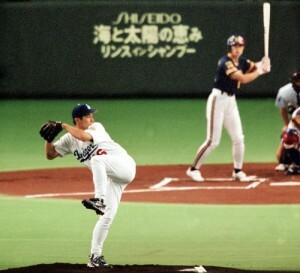 Nomo Mania began in the 1995 season, when he splashed onto the Major League scene with the Los Angeles Dodgers, seemingly out of nowhere, after a bitter contract dispute with the Kintetsu Buffaloes of the Pacific League in Japan. Mesmerizing crowds and bewildering opposing batters at every ballpark with his never-before-seen “tornado” windup style, he finished the season with an impressive résumé, leading the league in strikeouts, a 13-6 record and a 2.54 ERA. And let’s not forget he was the starting pitcher for the National League in the All-Star Game. His performance was even more impressive the following season, going 16-11 and capping the year off with a no-hitter at Denver’s Coors Field, the hitter’s paradise. All these numbers, however, don’t begin to tell the story of Nomo, whose legacy, while paling in comparison to that of Jackie Robinson, warrants a discussion as a future Hall of Fame member for his contributions to the game of baseball as a whole. The challenges he faced in paving the way for other Japanese players to come to the Majors cannot be understated. If you think the 24/7 media scrutiny Ichiro, Matsui or Dice-K have received in their time here is bad, Nomo’s plight makes them look like spoiled children on My Super Sweet 16. A Japanese baseball player playing outside of Japan at that time was not only unprecedented, but also seen as a bit of an insult in the eyes of many Japanese, many of whom lived and died by baseball. They sincerely believed that the Japanese brand of baseball was the best in the world. I viewed Nomo’s move to the States in the same way other Japanese did. I came to the States from Japan in the summer of 1994, shortly before Nomo. As an obsessed baseball fan growing up in Tokyo, idolizing the likes of Nomo, it was even more difficult for me to see him abandon not only his team, but also his country. In Japan, where loyalty is of the utmost importance, Nomo’s decision was a slap in the face. The reaction to Nomo’s defection to the Majors was in stark contrast to the fanfare and celebration that preceded the departures of Ichiro, Matusi and Daisuke. His every move, on and off the field, was questioned and dissected, partially because some Japanese, even those in the media, wanted to see him fail. But this attitude from his countrymen made his accomplishments in the majors, including throwing no-hitters in both the National and American Leagues (one of only five pitchers in the history of the MLB to accomplish this feat), even more impressive. Ichiro, Matsui and Daisuke came to the majors with the entirety of Japan backing them and cheering them on to succeed. Not Nomo. Ichiro, Matsui and Daisuke came over having multiple destination options and double-digit million dollar contracts. Not Nomo. Ichiro, Matsui and Daisuke had the option to always go back to Japan if things didn’t go so well stateside without receiving a ton of criticism because their failures would have been characterized as “difference in style of play between Japan and America.” Not Nomo. He didn’t have the luxury of being able to go back home. He put everything on the line in coming to the Majors. He had no choice but to succeed. Nomo’s legacy lies beyond the precedents he set for his fellow countrymen dreaming to play in the Majors. Were it not for his successful career, we wouldn’t be seeing the Yankees play their opener in Tokyo. The so called “posting system” that enabled Matsui and Daisuke to make their move to the Majors would have never been implemented and without Nomo, the World Baseball Classic might not have been established. And we can’t overlook that Nomo brought many baseball fans, who were still upset about the 1994-95 baseball strike, back to the ballparks with his tornado delivery. His style and success helped renew interest in the sport that America calls its favorite pastime. While we can’t give Nomo all the credit for the globalization of baseball in the last decade, the success that he enjoyed encouraged 42 other Japanese players to successfully make their way to the Majors since then. This alone speaks volumes. Sure, Ichiro might have ended up playing in the Majors anyway, but perhaps not as early as 2001. And Nomo’s success certainly influenced general managers across the MLB to look outside of the U.S. to not only Japan, but other Asian countries as well. The infusion of Latin and Asian players into the Majors in the last 15 years, along with the additional revenue the MLB has generated with its globalization initiatives, must, at least in part, be credited to him. With all of these accomplishments, is there room for him in the Baseball Hall of Fame? Not just for his impressive statistics, but for the legacy he left behind? Even when he retired and moved back to Japan, where he was hired to be the Orix Buffaloes’ manager, his desire to implement the American/MLB style of practice and conditioning was unwelcome, and he was eventually let go. It’s truly a shame that someone who has set so many records in Japanese baseball history has yet to be inducted into even the Japanese Baseball Hall of Fame. In fact, there is still a debate around whether he will ever be inducted because of Japan’s grudge over his defection to the Majors 16 years ago. So tell me, America, for a man who left his home and country and changed the MLB both with how he played and for those that followed him, can we and our Hall of Fame give this guy the love that he deserves?